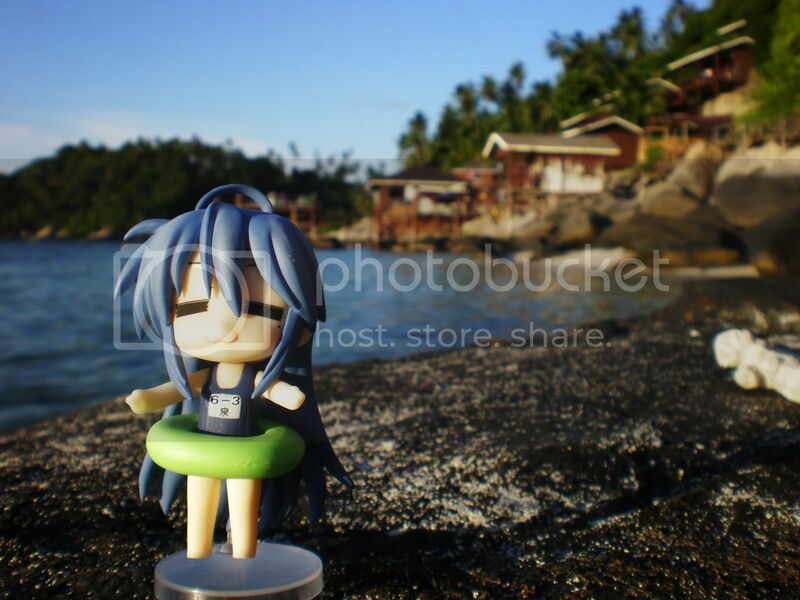 ~Eternal Snow~: Kona-chan @ Pulau Aur. 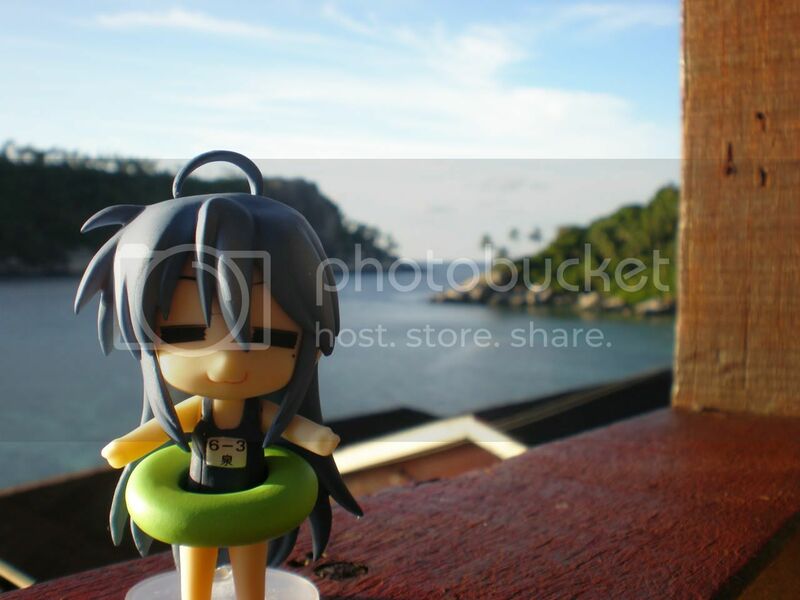 Over the weekend, I went to Pulau Aur, Malaysia, for a scuba diving trip; and little did I know that Kona-chan decided to sneak into my bag and tagged along on the trip, all prepared in her sukuru-mizugi and a cute greenish float. 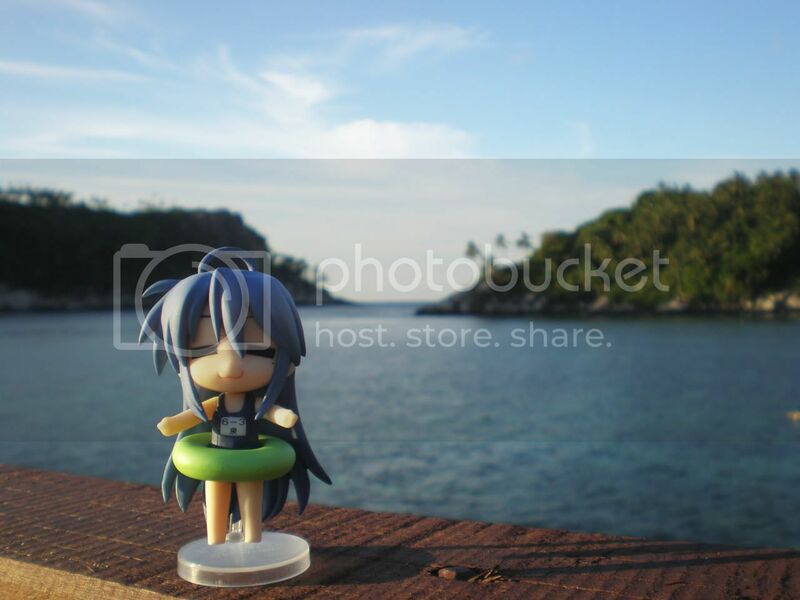 Either way, it was too late to send her back home since we're already at the island, so I took some photos of her. -ω-. Clear sunny skies, enjoying the view from the room's patio. Down by the rocky beach, playing around. Still by the rocks, view of our accommodations. The place we stayed in, Diver's Lodge. Down at the jetty area, relaxing after a dive. 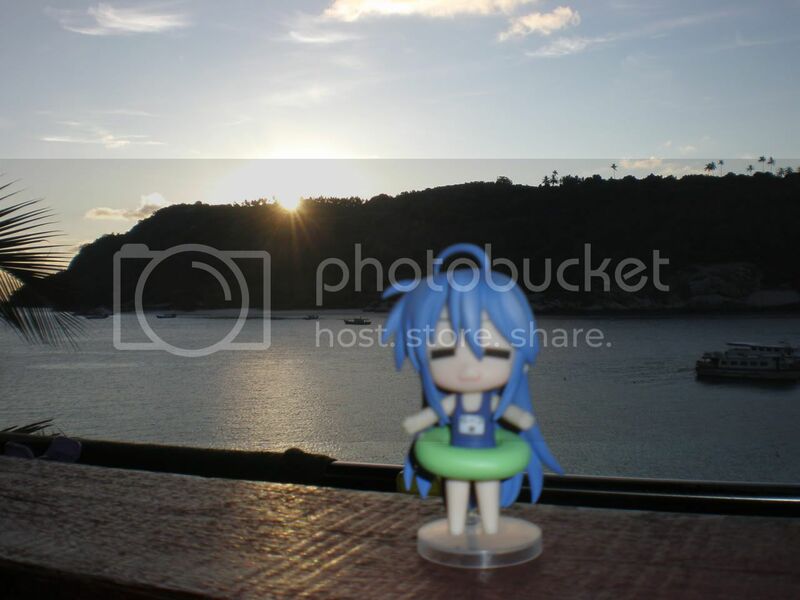 Sadly, even though I had wanted to take more photos of Kona-chan and Aur itself, my PnS camera decided to die on me (I forgot to charge my batteries!!). No underwater photos too since I didn't have a dive camera for this trip. That's it for now, time to work on my other entry which was supposed to be up on Friday (with added inspiration from stargazing after this trip). Enjoy and out! 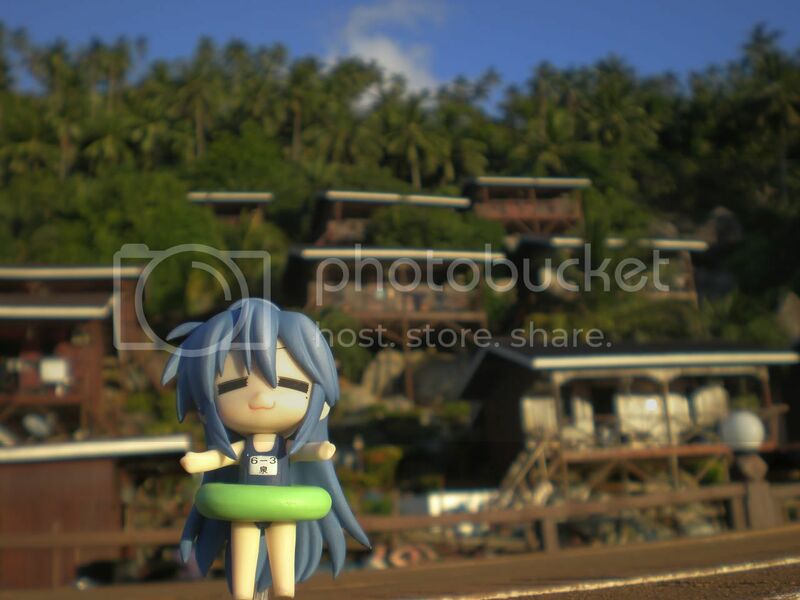 And great lighting on Konata. Hmm...if you're not a diver, it's not recommended to visit Aur, since it's a 2 1/2 hr bus journey, followed by a 4-5hrs overnight boat ride (that shakes from left to right) to reach the island (where you'll reach at about 5am in the morning). This place is mainly for diving only, nothing else to do thus will bore you to death. But yea it does have a nice scenery. However if you're looking for a place to retreat and just relax on an off-shore island, I'll suggest Pulau Tioman. The bus trip to Mersing is the same time spent, but a 45min speedboat ride to the island is so much better. As for the lighting, all natural sun besides the last shot ^^. Nice shots Hirito. Scenery is nice indeed. 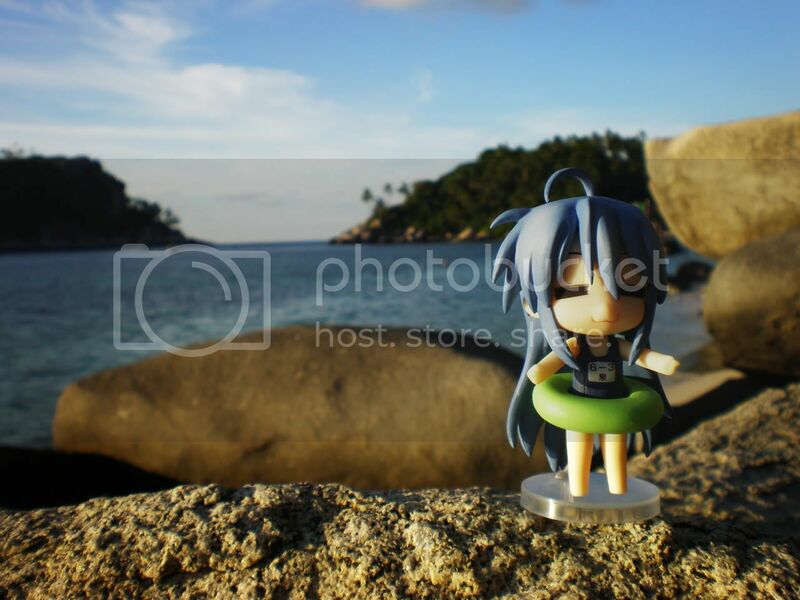 Ok.. Gonna put this as one of my destination list..
hey hirito, just nice i wanted to ask u some question. where in singapore can i find good diving shops? i'm looking for Aeroskin brand of dive suit made of thin lycra with zip at the fornt. can u recommend me some dive shops? mizunaga: yea it has quite a nice scenery there. fariz: as mentioned earlier, I think locations like Tioman or Redang will be alot better for the non-divers, but I wouldn't stop you for heading here just for fun ^^. Or pick up diving at the same time!! gordon: The shop where I bought most of my equipment from is DiveMasters Pratama. With regards to the Aeroskin brand of wetsuits, seems that the only one I knows who brings it in is Richmond Supplies & Services Pte. Ltd. Here's the addresses. As for dive shops/companies, I'm not too sure which are the really good ones, in which so far all the groups I've traveled with are good to a certain degree. shiat. i needs that figure. where can i still buy it at a reasonable price? any idea? anon coward: In SG, I'm not sure if there's still any of the anime shops still have the LS Nendoroid Petit Set 1, and even if they still have you'll have to lucky draw or just buy the whole box. Next and better alternative is to find someone who is going Japan to help you find, but I've seen this particular Kona-chan going for about 2,300 yen individual, but at least it's confirmed to be her instead of risking buying mass boxes and not get any. In my case, I bought the full set for 7,000 yen so I got every single character.